Discussion in 'XJ DIY How-To Instructions' started by Gamuru, Oct 14, 2007. A relay is a simple electromechanical switch made up of an electromagnet and a set of contacts. Relays are found hidden in all sorts of devices. In fact, some of the first computers ever built used relays to implement Boolean gates. 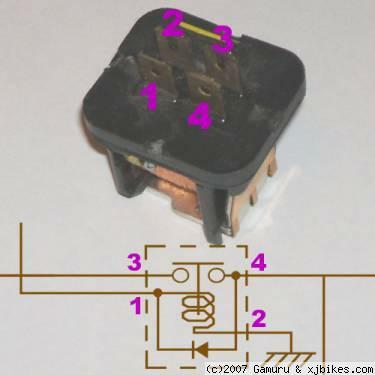 In this figure, you can see that a relay consists of two separate and completely independent circuits. The first is at the bottom and drives the electromagnet. In this circuit, a switch is controlling power to the electromagnet. When the switch is on, the electromagnet is on, and it attracts the armature (blue). The armature is acting as a switch in the second circuit. When the electromagnet is energized, the armature completes the second circuit and the light is on. When the electromagnet is not energized, the spring pulls the armature away and the circuit is not complete. In that case, the light is dark. But why use a relay? Why not just run the power through the switch? In general, the point of a relay is to use a small amount of power in the electromagnet -- coming, say, from a small dashboard switch or a low-power electronic circuit -- to move an armature that is able to switch a much larger amount of power. For example, you might want the electromagnet to energize using 5 volts and 50 milliamps (250 milliwatts), while the armature can support 120V AC at 2 amps (240 watts). Most relays work on these basic principles. However, there are a variety of configurations that you will run into and you must adjust your testing techniques for each unique situation and relay. Understanding the basics will give you the knowledge to handle the more complicated relays found not only on XJ motorcycles, but in your automobiles and home electronics. Heck, you may even get comfortable tearing one apart to "tune it up" with a point file. 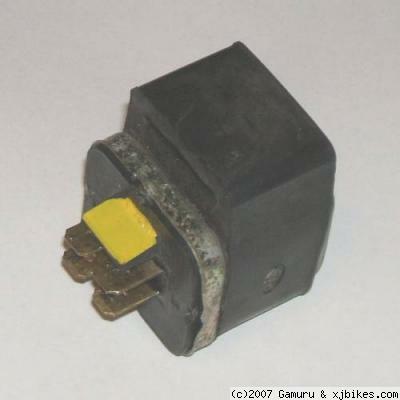 Pictured here is a headlight relay I grabbed off my '81 Virago parts bike. I'm pretty sure it's the same relay used on the Maxim and Seca, too. I've gone ahead and popped the cover off this relay to show you what it looks like on the inside. Just like the How Stuff Works quote above, this relay has an electromagnetic coil, an armature, a return spring and a set of contacts. 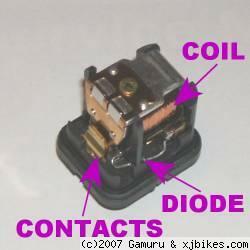 This particular coil also contains a diode. A diode, put simply, allows current to flow through it in only one direction. It acts like a one-way check valve for electricity. I'll explain why this relay has one in a moment. Looking at the picture below, we're going to be referring to the spade terminals as I have marked them since they weren't indexed by the relay's manufacturer. Note the position of the pigtail's indexing tab (yellow paint). On my bike, power comes in on Pin 1 from the alternator. If this were for a generic lighting circuit, this could be where a toggle switch would be hooked to. From Pin 1, power flows through the coil and completes its path to ground on Pin 2. When current flows from Pin 1 to Pin 2, the electromagnetic field pulls the armature down into the coil's body. The contact lever that is hooked to the armature is then closed across Pin 3 and Pin 4. Power comes from the battery on Pin 3, and--when closed--flows to Pin 4. From Pin 4, it flows out to the headlight (or whatever we happen to be powering with this relay). What's unique about this particular relay is the diode that ties Pin 4 back to Pin 1. The diode allows power to flow from Pin 4 to Pin 1, but not the other way. This allows power to keep the relay energized once power is allowed to flow from Pin 3 to Pin 4. As a matter of fact, you could remove power from coming in on Pin 1 and the relay's contacts would remain closed because power would flow from Pin 4 through the diode back to Pin 1. The only way to open the contacts would be to cut power to Pin 3. To test this relay, hook an ohm meter to Pin 1 and Pin 2. You should have some continuity across these pins. Most of the time when you're testing relays there is no way of determining the what the resistance of the coil should be, so you're left with just checking whether it has continuity or not. Except for the rarest of occasions, this is adequate when troubleshooting a relay. If you have continuity through the coil, continue on. If you don't, the relay is bad and needs to be replaced. The next test is to check whether you have continuity across the contacts. First, since this relay is normal open, let's make sure the contacts aren't welded closed. Hook an ohm meter to Pin 3 and Pin 4. The meter should show an open circuit. If it doesn't, the relay is bad and needs to be repaired or replaced. 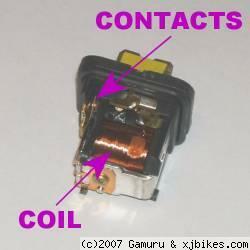 Next, you need to energize the coil so that it pulls the contacts closed. Hook a jumper wire from the battery to Pin 1 and a grounded wire to Pin 2. The relay should make an audible clicking sound when it latches closed. With an ohm meter still hooked to Pin 3 and Pin 4, you should be reading continuity now. If it doesn't, the relay is bad and needs to be repaired or replaced. Normally, this would conclude our troubleshooting procedure, but since this relay has an internal diode, we need to make sure it is functioning as well. As stated before, diodes allow current to flow one way but not the other. If you hook an ohm meter to Pin 1 and Pin 4, you may get continuity. If you don't, that's okay. Reverse the leads and check for continuity. If you didn't get continuity before, you should now. If you did continuity before, you shouldnâ€™t now. If you don't get continuity either way or you get continuity both ways, the diode is bad and the relay needs to be repaired or replaced. To repair the relay, you can sometimes file the contacts with a point file. This will extend the life of the relay for awhile, but you really should start looking for a new replacement. If the diode is bad, you can remove the old one and solder in a new one in its place. 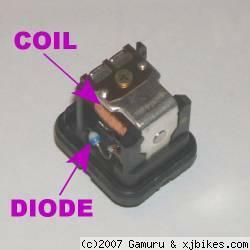 If the coil is bad, the relay is pretty much junk. Toss it and find a new one. As you check relays, you'll find most manufacturers will print the relay's diagram and pin locations on the body of the relay. However, sometimes they don't and you're forced to either open them up to see how they work or just replace them with new ones. I generally opt for option 1. Besides, if I break one while trying to pry the cover off of it, I've still got the other option to fall back on. That brings us to the end of this How-To. I hope the information I've provided here is useful and helps you diagnose your relay problems. I think it would be helpful to have and illustrated look at the differences there are between the Generic Power Relay and the Yamaha Safety Relay. The two look exactly alike. Although the "Load" Terminals are different from Generic Power Relay's than they are on the Safety Relay. I haven't learned how to get Graphic Material into my writing for the site, as yet. It's a powerful tool being able to add Photographs and illustrations and animation to the piece. I hope you enjoy making your contributions as much as I do mine. The feedback from those you help to learn and save money makes writing for the Forum a pleasure. Now a solenoid is a similar animal. Difference is the electromagnet on a solenoid is wrapped around a hollow core. There is a plunger that passes through the core. Energizing the magnet moves the plunger. The plunger can be used to move a mechanical device, or to actuate a switch. We often talk about starter solenoids and starter relays. Not sure on the XJ which term is technically correct. It doesn't really matter since they perform the same function.